There are several reasons a P0420 will come up as an error and illuminate the MIL. A lot of people are scared of it. They get all excited and search all over the internet to try and guess at what they should do. Reading good advise and bad trying to save money and hoping its not a Catalytic converter gone bad. Well, I have been trying to inform as many people as I can that the 420 code is not a scary animal that is going to eat your wallet. This code simply means that somewhere in the chain of events that controls the overall performance of the engine there is a problem and you have to find it. So, in an attempt to show some data and explain simply what I found, I decided to video some diag segments and show the live data from the vehicle. I will do this to show differences as they come up. Today I had 2 Subarus with emission issues. The first was a 96 Legacy wagon AWD 2.2 that was low on coolant due to a crack in the radiator and the ECT value was causing issue with starting because it controls the IAC position. It reported high temperature to the ECM which closed the IAC. No air - No start. The second is the following. I am uploading video now. It is from a 2001 LLBean with just shy of 199,000 miles. The MIL was on for a week and went off this morning as the owner was driving it to me. I checked all the systems on the car for error codes and the only one was a P0420 still stored as active. So I began watching data from the car. I first let it sit for a couple hours to cool down. Checked the oil, dirty but full. Coolant level was good. Battery amperage checked out excellent at 705 A output and conductivity measured 650 A at the block so grounding was good. Air filter was mediocre so I left it for now to keep the car in the same condition it was in when the MIL set. The owner hadn't driven it much since the light, so the same gas was in the tank. There is a point in the video where I thought one thing and said another. I referred to the oxygen sensor as storing oxygen when in fact I meant the sensor was reflecting the cat storing oxygen then it let go, the cat. There still may be an issue with the cat, but at this time I cannot condemn a part that is working through another issue with the engine. In this case, the engine is overheating due to a stuck thermostat and the HC's are actually being burned due to overheating before reaching the CAT. Since this is occurring and the ECM is programmed to expect other values from the O2 sensor, it reports that the CAT is not functioning as it was designed and illuminates the MIL. So a thermostat is in order as well as a fuel filter which you will see why toward the end in the fuel trim value for bank 2. Since the engine runs almost perfect up to the point of overtemp, there is no need to replace the ignition plugs at this time. It was recommended based on the mileage as preventive maintenance. The owner is considering selling the vehicle since she doesn't drive it much anymore and has a smaller car she uses for the higher MPG's, so the car is parked until she decides to repair it or its sold. You also need to know that if any of the above issues go on too long, it will damage the catalytic converter to the point it will necessitate replacement. klausc, Chuck123, cthies and 2 others like this. 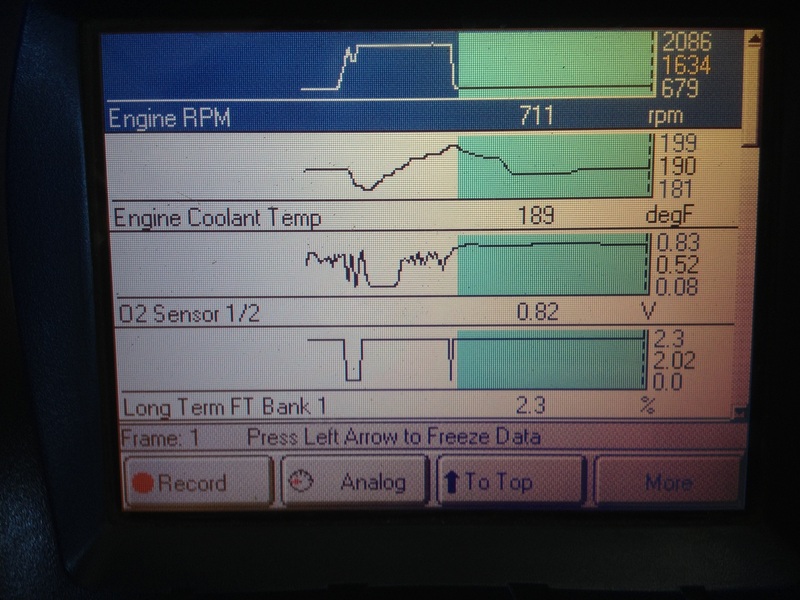 Good video, making the case for taking the time to diagnose before changing parts, in this instance through scanner logging and graphing and then (perhaps even more important) being able to interpret the information that is being provided by the OBD system. In the video, around 0:13, the temperature gauge appears to be mid-way. I'm not familiar with the "normal" range on the 2001 and was wondering if that indication is above normal, thereby reflecting the high 230 degrees indicated on the scanner, or is this a case where the temperature gauge did not show what was actually happening? The connection between the fuel trim and fuel filter is interesting. The LT Fuel Trim on both banks remains negative (2:29), whereas the Short Term Fuel Trim on Bank 2 is noticeably positive (around 2:47). Any ideas as to why would it be positive on Bank 2 but not Bank 1 (presuming that the fuel filter is inhibiting fuel flow)? should be very helpful, can't wait to view. The temperature gauges are a funny thing. It will meander around midway until the temp starts above 215. In the video shot, the temp gauge was appropriate for the temperature, midway around 195-200. Attached are photos I took of the scan tool screen after we replaced the thermostat, (with a Subaru part), fuel filter, oil change with 5/30 and a fresh set of NGK 6 plugs. The customer decided to go ahead and keep it. Quicker than a video upload. The temperature fluctuates normally as you can see. The rear O2 sensor values changed to reflect the CAT is working as it should. No more dumping the oxygen. The fuel trim changed 4% over previous toward the positive also indicating a good combustion. The photo are at idle, cruise rpm then idle again. Final result is no catalytic converter, no AF sensors, no O2 sensor, no other sensors. The ignition plugs that were removed had worn to an average gap of .046. Still manageable, but worn none the less. Replaced as a preventive maintenance. Awesome Cardoc!! I had my car throw that code and my mechanic said the same thing. New CC!! I had him reset the lights and they still are not back on. No new CC for me. I do believe mine was bad gas. I filled it up with new gas and the light has not come back on. that doesn't mean too much - pretty good chance of the code coming back in a month or a year. hopefully it doesn't but it would be good for you to know that it's fairly common for these codes to make guest appearances that increase over time. I have seen a number of vehicles come in with the 420 code and it ended up being the gasoline. A lot this time of year when the oil companies are switching to winter blends. Mostly through the year it is, in decending order of repairs, thermostat, plugs (or other ignition), filters, exhaust or intake leaks, injector seals, injector(s), MAF/MAP sensors, rear O2, AF sensors on Japanese cars, front O2 on others, and lastly the CAT. I do get some that require a new catalytic converter, but that is only after long periods of running a vehicle with issues whether it be the type of gas, ignition plugs worn, vacuum leaks, clogged fuel filter, etc., and they are few and far between. Catlytic converters are designed to last a great number of years as long as the engine performs as it was designed. Too rich or too lean kills them quick whether with carbon build up or overheating. If a catalytic converter is bad, you need to make sure its bad then find what caused it to fail. Otherwise, you will destroy the new one. And, some shops are quick to replace a CAT because they are actually cheaper than you think when purchased in bulk wholesale or jobber and the markup used is outrageous, then you have the labor added on which comes down to profit margin. A new cat will burn more efficiently than a used one and will mask a problem with engine performance. These shops know this. Some maybe not and they are under the impression that a 420 code is a dead giveaway. If that engine light comes back on for P0420, Catalyst Efficiency Below Threshold, go through the list and check everything on it first. When I get a vehicle in with a bad CAT, which may take a while, I will post a video of the data so you can see the difference in the feedback to the ECM and you will know what I am talking about. And, the sensor data is available on a lot of the low cost scanners you can buy at a parts store. This has been a really very informative thread and I look forward to more of your ideas for diagnosing problems. cardoc: I have a general question that comes out if the video. 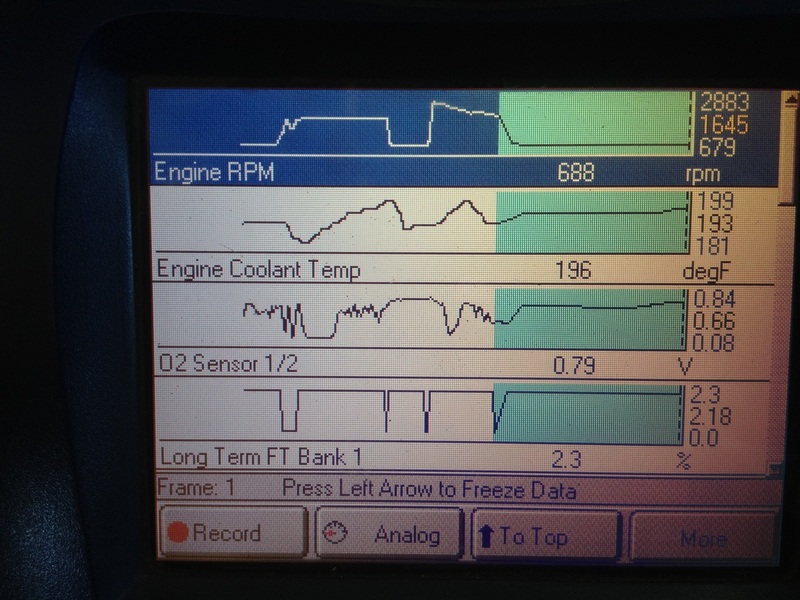 Do you find that having a car in the shop idling or manually revved up is usually sufficient to arrive at a diagnosis through graphing/logging of parameters, as in the case of the video, or do you find that often it's necessary to go out on the road while observing the scanner (with someone else driving, of course)? The genisys EVO you're using is quite the scanner (referring to showing several graphs at the same time). Depends on what I am looking for. 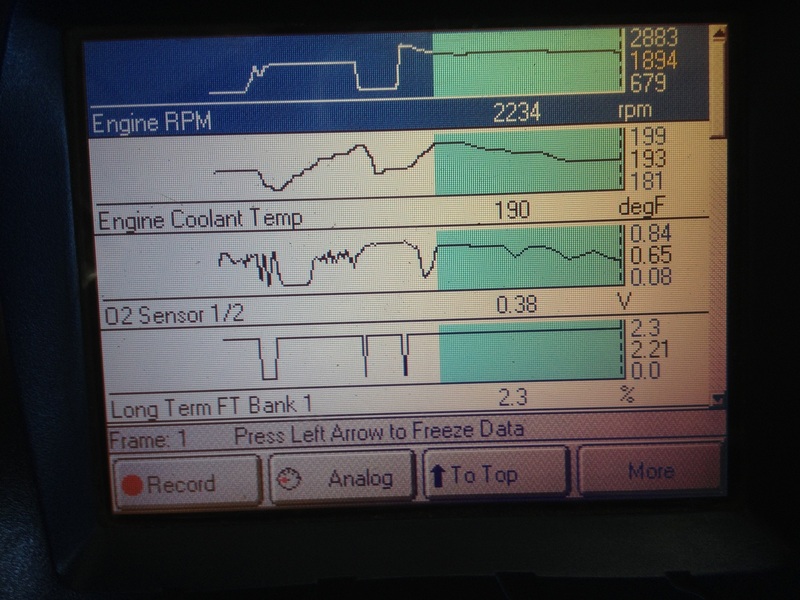 If its transmission related or VVT, then I need to drive the car and I record while I'm driving or glance over at the graph to see if there is a change I'm looking for. Usually, unless it is something directly related to engine load, I can do it in the bay. And the EVO will print the recorded data to my printer for visual aid to the customers or for ease of looking at the data stream without toggling up and down the screen. And the EVO will print the recorded data to my printer for visual aid to the customers . . .
Having the right tools, and knowing how to use them, shows it's worth. I had a look at the EVO website and was impressed by the genisys EVO; the unit is understandably professional-level, but quite comprehensive and beneficial. Will look forward to more valuable insights such as this one on P0420.